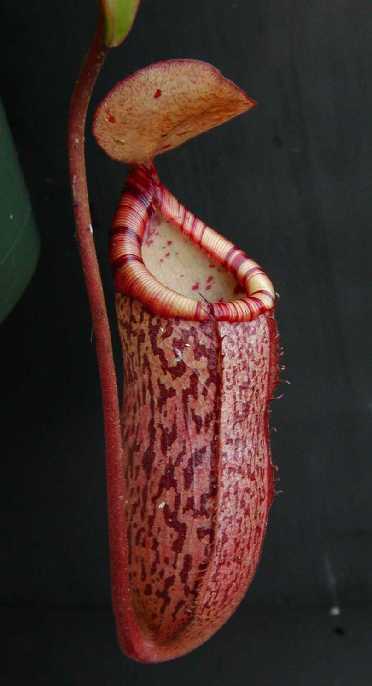 Nepenthes spectabilis X ventricosa is a hybrid between two highland parents. Most of the coloring is attributed from the N. spectabilis. There is some waist "pinching" apparent from the N. ventricosa. I love primary crosses with N. ventricosa. They are extremely hardy and grow fairly quickly. I've found that N. ventricosa roots readily from cuttings so maybe hybrids involving N. ventricosa will as well. This hybrid was purchased from Hortus Botanicus. I'm not aware yet where this plant originated from but is most likely an Exotica Plants cross. The peristome has some nice black barring in it from the N. spectabilis parentage and is turning out to be a nice hybrid. Many other hybrids that use N. spectabilis as a primary parent turn out to be very nice. I've have had no problems with this hybrid and would consider this a beginners plant because of its hardiness and adaptability.